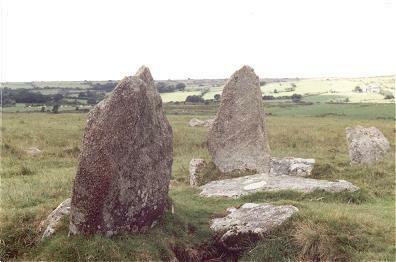 There are several stone circles on Bodmin Moor, including Trippet, Stripple, The Hurlers and Fernacre, but Stannon can be found in few books of Archaeology or Antiquity. Why this should be is a mystery as it is a fine Cornish ring of some nearly 70 small stones, about 40 of which are still standing, in an impressive 43 metre by 39 flattened circle. Perched on the gentle slope of Dinnever Hill, it also has four guardian outliers, looking rather like shark's teeth, and to one side a huge modern china clay works. It could be this site's remoteness that see's it excluded from guide books, but that is part of its charm - the only other creatures you are likely to encounter here are the sheep and wild horses of the moor. The circle dates from either the late Neolithic or early Bronze Age.